Chambered nautilus once dominated the ancient seas of the world. Now they are found alive in the southwestern Pacific. Considered to be living fossils, they have been traced back 500 million years. 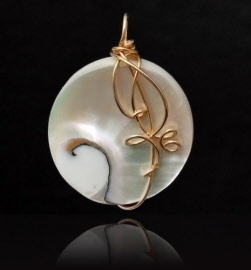 The nautilus shell is composed of two layers: a matte white outer layer, and a striking white iridescent inner layer. The innermost portion of the shell is a pearlescent blue-gray. Flashes of coral, yellow, bright green, fuchsia, purple and blue can be seen as the shell moves and light reflects off of the surface. 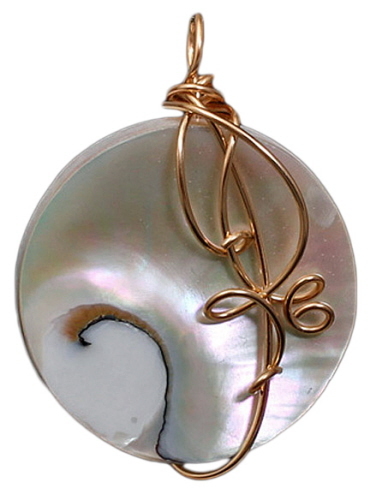 No two shells are exactly alike and the wire wrap design varies with each pendant. Wrapped in 14kt rolled gold wire or argentium wire. The pendant you receive may not be the exact pendant shown here. A picture will be emailed to you, for your approval, prior to the completion of your order. Finished size is ~45 mm x 32 mm. Weight is 0.4 oz. 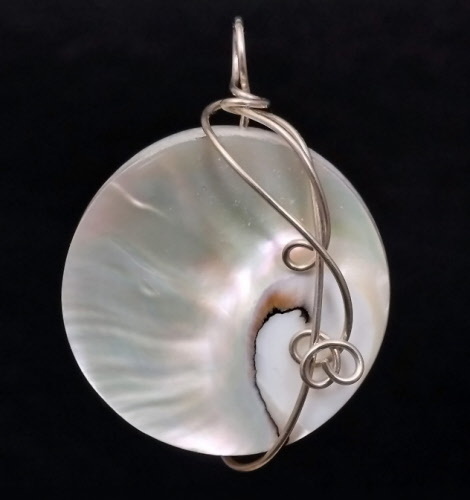 The nautilus, a symbol for perfection, beauty and strength; believed to have the ability to chase away evil spirits.